I posted one of these Twins Reloaded a while ago. You can read about the Edward & Bella pairing here. At the time it was the only complete set they had at Dischem. They had the colours for each pairing but only had the Bella topper. Imagine my surprise when I walked into Dischem the other day and saw they had the topper for the Romeo & Julia pairing. I snatched them up immediate. I hope they will have the other one in stock soon as well. I have no idea why they have decided to name them Romeo and Julia instead of Juliet. It seems a little odd that they kept all the other ‘couples’ with the same name except for this one. Either way, it’s still super pretty. 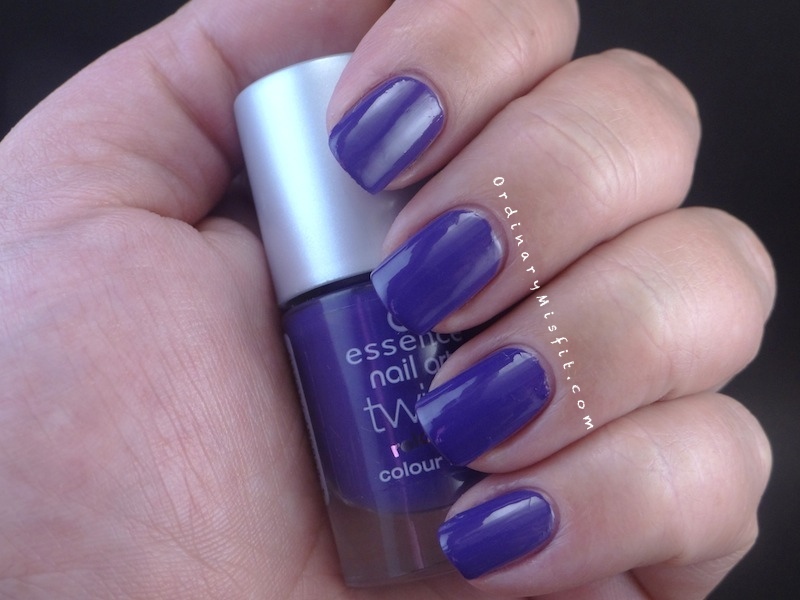 Essence – Romeo is a darker grape purple creme. This is two coats with no topcoat. Romeo applied really well and I love the shiny, glossy finish. This is Essence – Julia. One coat over two coats of Romeo. 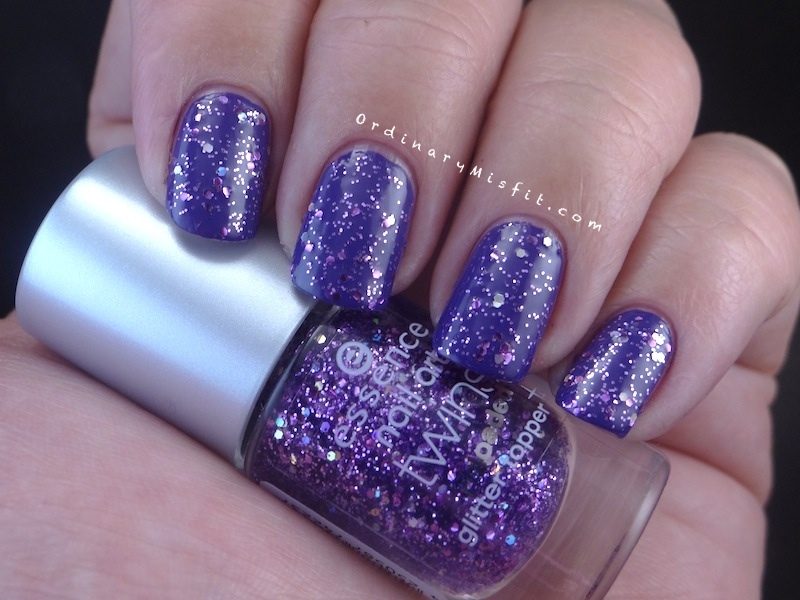 Julia is a clear base packed with purple and holographic glitter in different shapes and sizes. Even though these look amazing together I actually can’t wait to try the glitter over another colour. Or even try the Bella glitter over this Romeo. If you are a purple lover you will love this! You will love this together or individually. These polishes are available at Dischem for R19.95 each. They don’t come together so if you prefer just the one you are free to get the one. You can also pair them in any way you wish, which I think is really nice. I don’t like Romeo but with Julia, it works great! I’d love to see Julia over darker colours, that be kwaai! Romeo is quite a dark purple which I do like but I also think it looks best with Julia. I think Julia would look amazing over dark colours too. 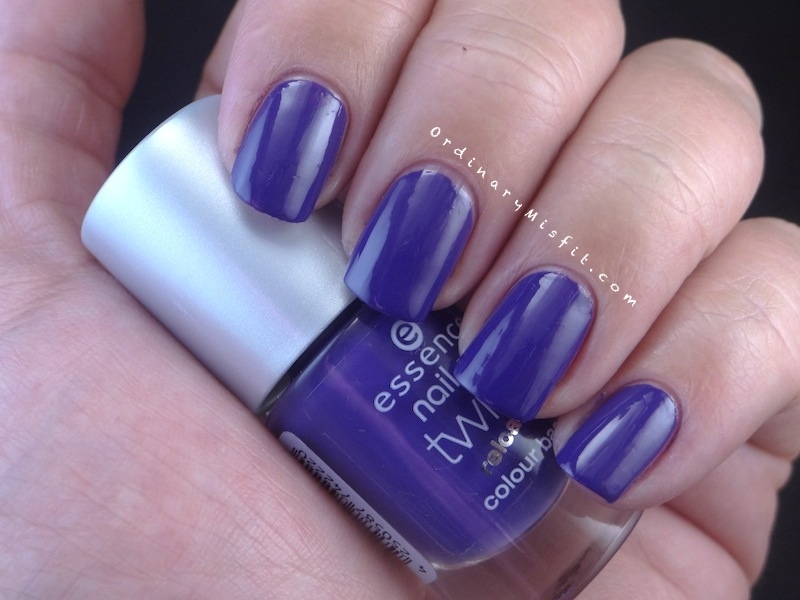 I am a huge fan of purple so I love this immediately! My Dischem is the same! All the cremes are there but none of their toppers. This is an awesome set but I agree. I think Julia (really?? Julia??) will look awesome over other color bases! I know right? What is up with Julia?? I don’t get it. Anyway, our Dischem has finally pulled finger, even though the other glitters were smartly hidden behind the first set of glitters. Not cool Dischem! I love the glitter one. It’s amazing! Thanks! I love the glitter too! I can already imagine all the colours it can go with! I am so annoyed by Romeo and “Julia” I can barely focus on the swatches, lol!